Many Egyptians still remember the eagerly awaited speeches of presidents Gamal Abdel Nasser and Anwar Sadat, and the intense debate that usually followed. Nowadays the eagerness and the debate are still alive. 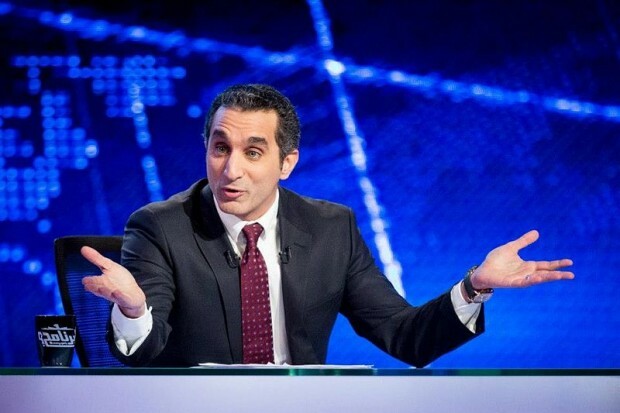 But now Egyptians are not waiting to watch their president, Mohamed Morsi, but rather the man who is poking fun of him – the satirist Bassem Youssef. Mr. Youssef has become Egypt’s most popular comedian with his Friday night TV show El Bernameg (“The Program”). Modeled on Jon Stewart’s Daily Show, his merciless, biting jokesabout Mr. Morsi’s poor performance, bad English and Islamic fundamentalism have earned him million of fans – and also many enemies. Last week’s arrest of Mr. Youssef for “insulting the president, denigrating Islam and disturbing the peace” has created a public outcry inside and outside Egypt, and even a tense Twitter exchangebetween the U.S. embassy in Cairo and the Egyptian presidency. Many rightly raised concerns about the future of freedom of expression and Egypt under the rule of the Muslim Brotherhood. On Friday, Egyptians were glued to their seats watching the first episode of Mr. Youssef’s program after his discharge on bail pending investigation. It has already attracted more than 800,000 YouTube views. The phenomenon of Bassem Youssef and the Islamists’ uproar against him has political, social and religious dimensions that must be explored to understand the current dynamics in Egypt. First, the religious side: Mr. Youssef’s opponents cite a verse in the Koran (Soura of Hojorat, verse 11) that states “Don’t make fun of people” as proof that satire is wrong and that Mr. Youssef has broken the religious code. This view is part of a wider theme adopted by literal Islamists who inappropriately interpret the Koran to justify their views. But their argument is fundamentally flawed, as Mr. Youssef did not ridicule the citizen, Mohamed Morsi, but rather the President of Egypt, who happened to be Mohamed Morsi. There is definitely nothing in the Koran to prohibit criticizing leaders; in fact, the opposite is true. God’s advice is to rule with justice, a quality that many Egyptians believe that Mr. Morsi is missing. It is also worth mentioning that Mr. Youssef was critical of other political and army figures before Mr. Morsi’s election and the Islamists never raised any concerns at that time. There is also a social element to the conflict: Sayed Hamad, a lawyer who filed one of the complaints against Bassem Youssef, claimed that the show is “shattering… all the values and ethics that we are used to.” What are these values and ethics? If the vociferous debate in social media is any indication, it seems that Islamists have a problem with basic definitions such as “respect” and “honor.” They believe that Mohamed Morsi should be respected and honored because he is the president of Egypt. Those who adopt this misconception forget that respect must be earned and not just given. Mr. Morsi will not be respected until he delivers his pre-election promises of freedom and justice. Being elected is merely a start of a long, winding road toward respect that may or may not be achieved. On the political front, there are three elements of successful leadership: initiating a change, creating a positive environment and delivering the aspired results. Thus far, Mr. Morsi has failed on all three fronts: Egypt’s collapsing economy and poisonous political environment have created a negative, tense atmosphere and failed to deliver any of the revolution’s goals. For many Egyptians, Mr. Morsi is one of the worst leaders in their country’ contemporary history; others may have been more tyrannical but at least they delivered on other fronts, particularly the economy. The Islamists’ growing anger with Bassem Youssef is a reflection of their failure, and of his success in exposing this failure with a magnifying glass. Mr. Youssef is a creative mix of vision, insight, depth and sharp Egyptian wit; he boldly challenges the Islamists’ rhetoric, exposing their hypocrisy. They never had such scrutiny before, and unsurprisingly, they feel pushed outside their comfort zone. Mr. Youssef, a pious, practicing Muslim, is one example of the current ideological war that engulfs Egypt following the January, 2011, revolution: a war between a political Islam that claims to be the sole representative of the faith and another growing element consisting of proud Muslims who reject dogma and extremism and are willing to fight to protect their faith from exploitations. On Saturday, an Egyptian court dismissed a lawsuit to halt Bassem Youssef’s show, a small victory for free speech in the country. However, there is still a long road ahead for the Egyptian revolution to prevail. Mr. Youssef blew much-needed, refreshing ripples into the toxic Egyptian political scene, and for that he should be applauded, and supported against those who are desperately trying to silence him. Also, here is part of his latest episode, mocking Qatar (Song: My Beloved Qatar with English subtitles. This entry was posted in Egypt, Qatar and tagged bassem youssef, Egypt, Islamism, Islamists, Morsi, Qatar. Bookmark the permalink. The problem, as it appears in the tweets you shared, is that they see political humor as propaganda. They don’t get the fact that political satire has a place in a robust democratic exchange. I still remember when Mubarak made an official complaint to Israel because one of our top satirists did a fabulous “Mubarak”. Our government asked him to stop, for the sake of the peace accords. No Israeli govt. official would ever get a break like that. Our satiricists are brutal towards our politicians. As it should be.